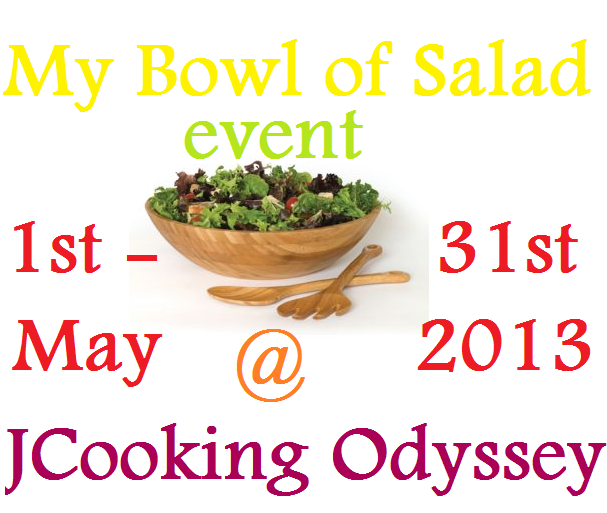 Jagruti's Cooking Odyssey: Event Announcement -My Bowl of Salad ! If you were boring, you'd probably say that salad is "rabbit food". This, as we all know, is not true! Made with a little bit of care and attention, salad can add a lot to your meals and definitely to your diet. The appeal of a salad is the colour, the various textures and of course the health benefits. They usually do not take very long to prepare and the art of assembling a salad means that you can experiment a lot with ingredients! Go on! Add some colour to your life! Prepare salad with vegetarian ingredients. Go ahead and send your fresh and colourful salad recipes. hey jagruti, Just realized That even though I have posted my recipe on date 1st may 2013 the blog date shows 30th april I dont know what is actually wrong!!! May be blog timings follow a different country you got any idea? Hi Aara, I have no idea why is that happen ? Maybe you can check in blogger support. But don't worry, Your entry is valid in this event. :) Thank you ! I have submitted few gestational diabetes salad recipes as well.